Data Exchange. – Life Is Such A Sweet Insanity. So “Pirates of the Caribbean” here at Walt Disney World’s Magic Kingdom opened this week after being down for refurbishment. One of the changes to the attraction was the elimination of the “wench sale” and they replaced it with a pirate selling valuable things. The refurbishment looks good. Many of the E-ticket attractions at Disney snap your photo at the perfect moment. As you exit the attraction there’s often monitors with photos of the folks that are exiting along with you. In the olden days you would then decide if you wanted to purchase the photo or not by visiting the gift shop. With today’s technology you tap your MagicBand or Photo Pass card and add the photo to your account. It is then available for purchase online. We purchased Disney’s “Memory Maker” package for this trip, so all of these photos, in addition to the photos taken by photographers around the parks, are available for download almost immediately. We were surprised to see multiple flashes on “Pirates of the Caribbean” because we didn’t think there was a photo opportunity on the attraction. As we exited the ride there were no monitors showing photos, so we just moved on. This photo showed up in our Photo Pass feed late last night. As a data geek I find this interesting. First of all, no one in our family tapped anything to correlate the photo with our Photo Pass feed. There was no MagicBand or Photo Pass confirmation action associated with this photo. 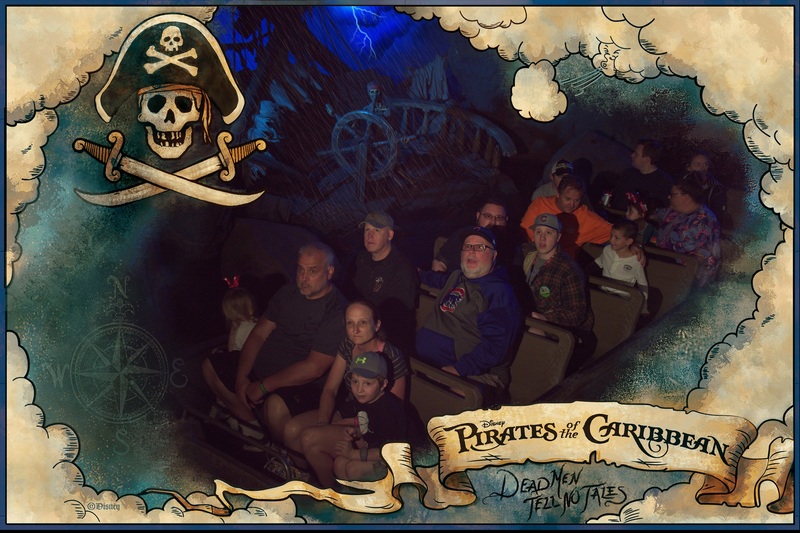 So Disney figured out it was our photo all on their own. At first I thought this was done through Facial Recognition, but I’m feeling more comfortable with another theory I have; they used GeoFencing. The “My Disney Experience” app on my phone has location services on but only when I’m using the app, not in the background. So this means the RFID chip in our MagicBands have enough juice for long range sensors. A quick look at Wikipedia confirms that the newer bands indeed work this way. In many ways this technology is very, very cool. I like it a lot and the whole data connectivity geek in me grooves on this. The only thing that gives me a bit of pause is that it links my face with my Disney activity. Not overly nefarious in itself but it could be used for evil purposes if this technology were to fall in the wrong hands. I’ll have to read up on the Disney Terms of Service. If Disney is making this information available to outside parties it will make me think twice. If Disney is using it for only Disney services, I think it’s pretty nifty.